Despite its name, the Drake Hotel (@thedrakehotel) is so much more than just a hotel. While they certainly offer a unique hotel experience (they’ve been named one of the top 100 hotels worldwide by Fodors travel guide), this city landmark is also an art and music hub with ongoing exhibits and live music featured in their Underground venue. 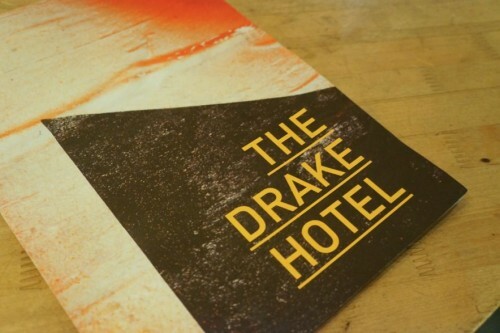 Needless to say, the Drake Hotel is an incredibly versatile destination in the city. But their versatility also applies to their culinary experience too – you can enjoy brunch in their cafe (which serves some really amazing blueberry scones, I might add), enjoy a drink or dinner in their lounge, or soak up a bit of sun on their rooftop patio, the Sky Yard, which is covered and heated in the winter. 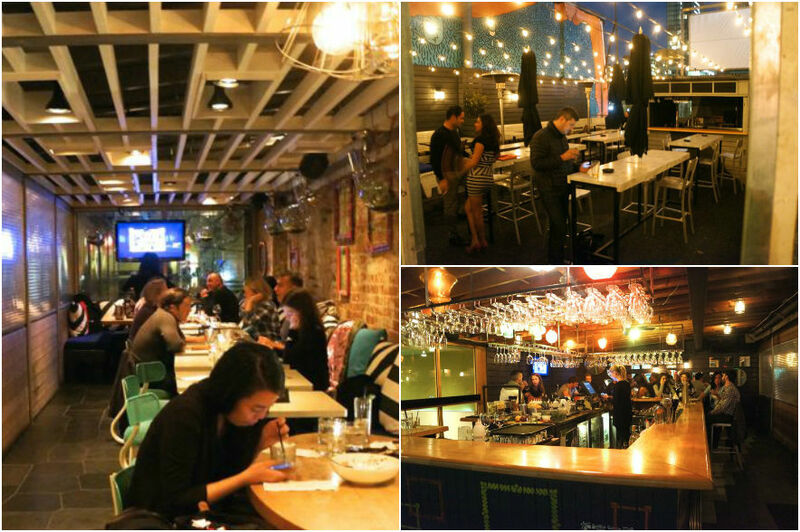 Their versatility, fantastic cocktails and food is why this is one of our go-to spots in the city. Last week I dropped by the Drake Hotel to check out their new menu which has been revamped for the fall. Chef de Cuisine Alexandra Feswick (@Alexandfeswick) recently joined the team and has introduced an exciting take on comfort classics with an increased focus on local, fresh and seasonal ingredients. New breakfast items include cinnamon french toast and a mushroom benny while new lunch options include a quinoa and rye berry salad, short rib pie and croque monsieur. 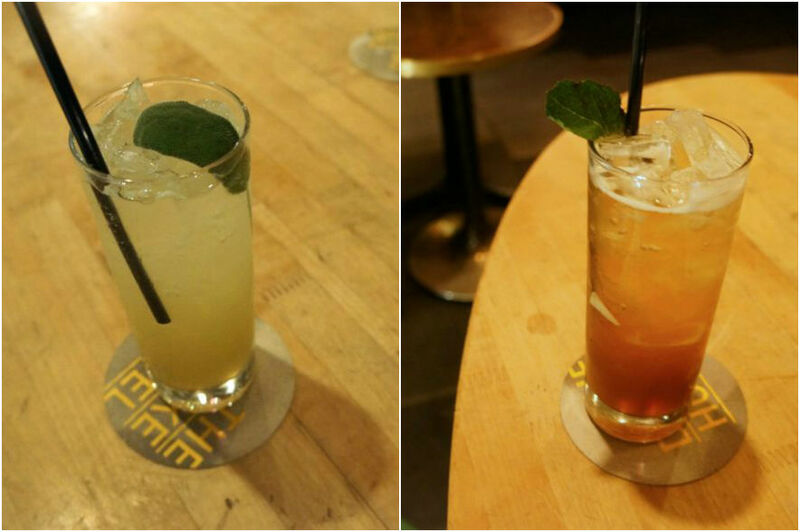 In addition to revamping the food menu, the Drake has also revamped their cocktail menu. Mike and I come to the Drake often for drinks and as much as we loved their previous cocktails, it’s really nice to see some new drinks on the menu. Last week I tried the Tea Time in the Hive – cucumber gin, matcha green tea, honey syrup, muddled sage, lemon juice & seltzer water ($13) and Artichoke Fizz – Cynar, maraschino liqueur, mint, lemon juice & agave nectar ($12). Both were delicious. I’m looking forward to drinking through the rest of their new menu! Our meal started out with the Bone Marrow & Crab – roasted beef bone marrow bone, Dungeness crab, herbed bread crumbs & grilled sourdough ($16). I’m a huge fan of bone marrow and the Drake’s version was no exception. 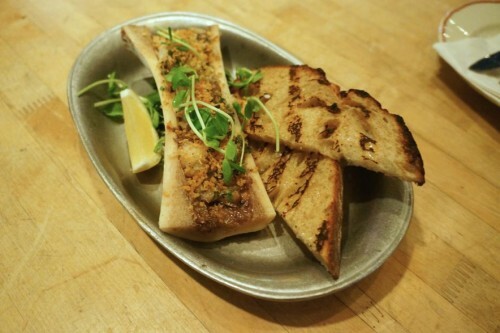 Spread some of the rich bone marrow and dungeness crab onto a slice of sourdough and you’ve got one perfect bite! Given its richness, this is definitely a sharing kinda appetizer. Up next was Nonna’s Carbonara – house made tagliatelle & pancetta, raw yolk, pecorino romano & fresh parsley tossed table side ($19). I love that they make their pasta in-house – it had such a nice chew to it. 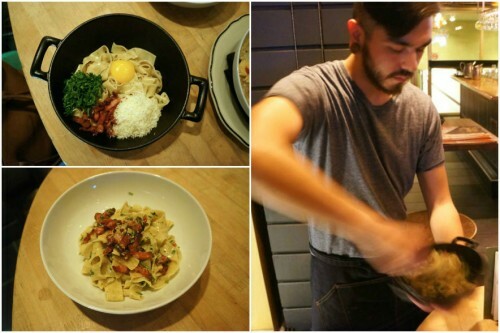 While carbonara’s are a simple dish, a good one is always incredibly satisfying. And we were definitely satisfied! 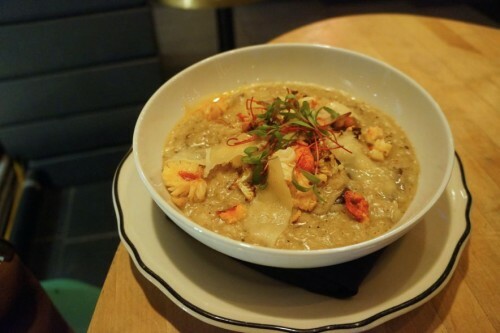 Our other main was the Truffled Cauliflower Risotto – wild mushrooms, roasted cauliflower, parmesan, bread crumbs ($19, +$9 to add Nova Scotia lobster). My mouth is watering just thinking about this risotto. With an intense mushroom flavour, you’ll be licking this bowl clean like we did. Despite the substantial portion of the dish we didn’t leave a grain of risotto in the bowl. It was that good. For dessert we tried the Choco-Banana Cake – hazelnut ganache, corn nuts, cream ($9). 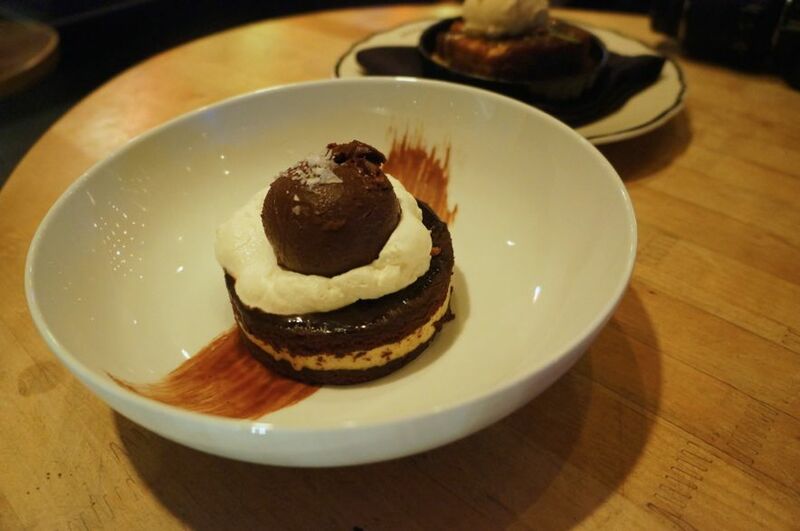 The dessert resembled a whoopie pie with two layers of chocolate cake sandwiching a delicious layer of filling. As if that wasn’t indulgent enough, the cake was topped with a dollop of hazelnut ganache and corn nuts which added a nice crunch to it. The other dessert we ordered was the Carrot-Toffee Pudding – pineapple caramel, rosemary-fernet ice cream ($9). 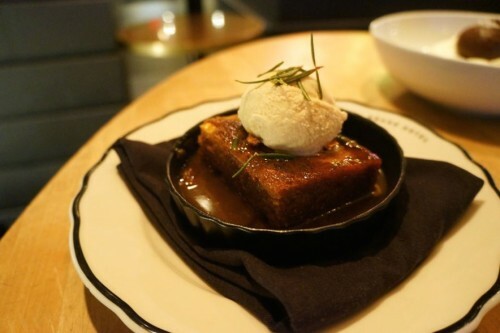 I thought it was a great fall dessert with the warm sticky cake sitting in a delicious pool of caramel. Since the main components of the dessert were quite sweet, the creative choice of ice cream complemented the pudding perfectly. As always, the Drake Hotel is churning some delicious things out of their kitchen. Come check out their new cocktails and fall dishes for yourself. You won’t be disappointed!